For many years, Concurrent Technologies has been working to augment the security features and capabilities on our board level products so that they are suitable for use in defense, communications, transportation and other critical embedded environments. UEFI BIOS – For many years, our products have shipped with both UEFI Class 2 capability with both UEFI and legacy BIOS elements. Starting in 2018, some products now support UEFI Class 3 BIOS which removes the legacy Compatibility Support Module BIOS. Having a UEFI BIOS is a prerequisite for some of the other security capabilities. 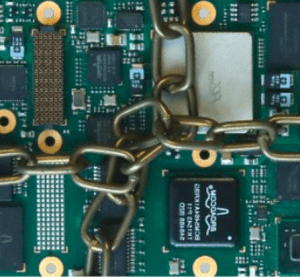 BOOT GUARD – Is a way of ensuring that boards are running our authorized firmware and, if not, to prevent the board from starting the boot process. Boot Guard prevents firmware tampering from the moment the product leaves the Concurrent Technologies factory throughout the life cycle of the product. SECURE BOOT – With Secure Boot enabled, a public key stored in the UEFI BIOS firmware is used to validate the bootloader before the operating system starts to load. Concurrent Technologies provides the user with the ability to replace any keys in the firmware enabling customers to use their own secure keys. TRUSTED PLATFORM MODULE – Is a tamper-resistant integrated circuit that was originally offered as an option but is now provided as standard on our recent processor boards. The TPM can perform cryptographic operations, including key generation, protect small amounts of sensitive information, such as passwords and cryptographic keys. GUARDIAN SECURITY PACKAGE – Is an holistic approach to board security; incorporating hardware, firmware and software elements. It prevents unauthorised use of secure equipment, unauthorised access to sensitive data and allows sensitive data to be purged on demand. The package allows the user to tailor their security level, from a fairly basic level to one that could potentially leave it inoperable if tampered with. Guardian Security package is designed to significantly improve processor board security to make them suitable for deployment in sensitive applications. It ties together specific hardware features with a range of software functionality to deter tampering and to lock access to intellectual property.